NETWORK FINALS: THE GOLDBERGS and SPEECHLESS gained 0.1 in final numbers, but BLACK-ISH lost the same. CABLE HIGHLIGHTS: Veteran shows thrived on Wednesday cable. The season finale of FX’s AMERICAN HORROR STORY topped the night, up 0.03 to 1.33. On Comedy Central, SOUTH PARK was down a tenth, but still very strong at 1.08, and LEGENDS OF CHAMBERLAIN HIGH was down 0.05 to 0.31. A&E’s DUCK DYNASTY returned for its final season with a 0.48 start, followed by the launch of GOING SI-RAL at 0.38, and the season premiere of WAHLBURGERS at 0.28/0.22. Among newer scripted shows, OWN’s QUEEN SUGAR climbed 0.04 to 0.48. On TV Land, YOUNGER gained 0.05 to 0.20, and IMPASTOR ticked up to 0.08. WGN’s SALEM returned to the Top 150, up 0.04 from last week to 0.10. 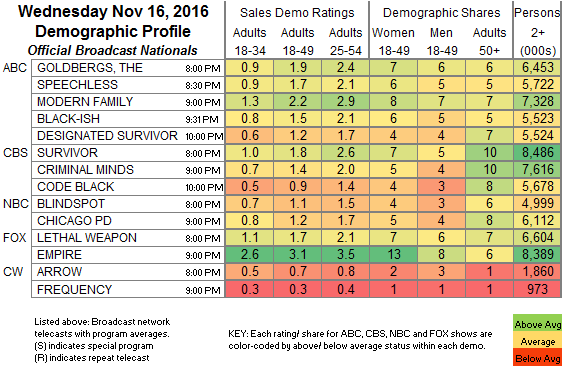 FXX aired back-to-back episodes of YOU’RE THE WORST as the season finale at 0.10/0.07, compared to 0.10 for last week’s episode. IFC’s had back-to-back episodes of STAN AGAINST EVIL at 0.06/138K and 0.07, compared to last week’s 0.07/0.08. Sundance’s RECTIFY held at 0.03/116K. ESPN’s NBA games had Golden State vs. Toronto at 0.77, and Clippers vs. Minnesota at 0.69. 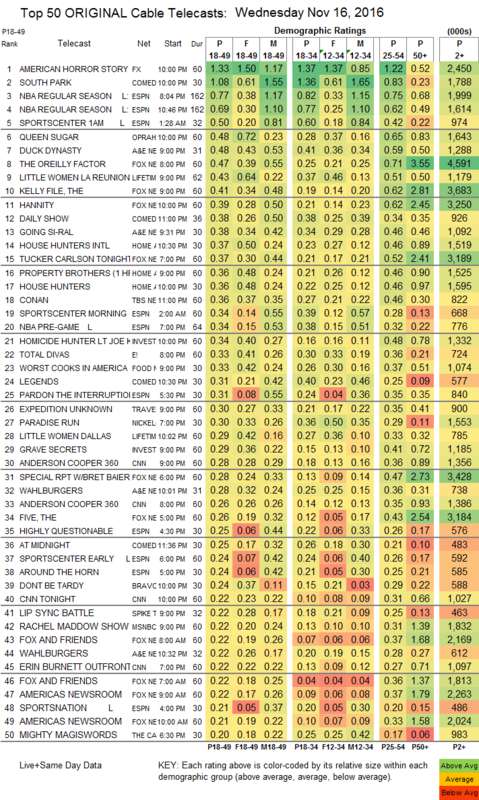 On Lifetime, the LITTLE WOMEN: LA reunion show rose 0.08 to 0.43, and DALLAS was down 0.03 to 0.29. Fox News’s ownership of post-election coverage continued with 2 shows in the night’s Top 10, led by THE O’REILLY FACTOR’s 0.47 (and 4.6M total viewers). On HGTV, HOUSE HUNTERS INTL grew by 0.07 to 0.37, PROPERTY BROS was up 0.02 to 0.36, and HOUSE HUNTERS rose 0.03 to 0.36. E!’s TOTAL DIVAS had a 0.33 season premiere, and the season finale of CATCHING KELCE was up 0.04 to 0.18. On Food Network, WORST COOKS IN AMERICA gained 0.08 to 0.33. Bravo’s DON’T BE TARDY fell 0.12 to 0.24. On Spike, LIP SYNC BATTLE dropped 0.07 to 0.22. TLC’s TODDLERS AND TIARAS rose 0.02 to 0.18. MTV’s REAL WORLD ticked down to 0.18, while its AFTER-SHOW ticked up to 0.11.